Transition Probabilities. Markov Chains. Potential Theory. Transcience and Recurrence. Pointwise Ergodic Theory. Transient Random Walks. Ergodic Theory of Harris Chains. Martin Boundary. Potential Theory for Harris Chains. Recurrent Random Walks. 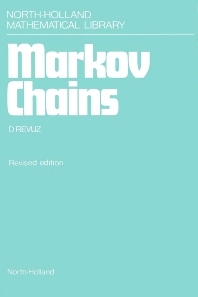 Construction of Markov Chains and Resolvents. This is the revised and augmented edition of a now classic book which is an introduction to sub-Markovian kernels on general measurable spaces and their associated homogeneous Markov chains. The first part, an expository text on the foundations of the subject, is intended for post-graduate students. A study of potential theory, the basic classification of chains according to their asymptotic behaviour and the celebrated Chacon-Ornstein theorem are examined in detail. The second part of the book is at a more advanced level and includes a treatment of random walks on general locally compact abelian groups. Further chapters develop renewal theory, an introduction to Martin boundary and the study of chains recurrent in the Harris sense. Finally, the last chapter deals with the construction of chains starting from a kernel satisfying some kind of maximum principle.